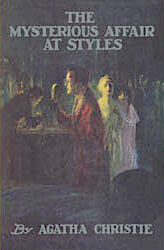 The Mysterious Affair at Styles was Christie's first published novel written during World War I (1916), during which she served as a nurse. It was published in the United States in 1920. Her crime story introduces her long-time character, a Belgian officer with a twirly mustache and egg-shaped head, Inspector Hercule Poirot, (who would later become Chief Inspector). Christie's novel was one of the first published paperbacks in 1935 by Penguin Books. Her novel is featured in our collections of Detective Novels and WWI Books. Chapter V. "It isn't Strychnine, is it?" Return to the Agatha Christie library.